CPSC spokesman: "We're headed for a lot of chaos in the economy because of this"
SILVER SPRING, Maryland (CNN) -- As Marilyn Seitz helps customers find just the right size, she wonders how much longer before she's forced to close her doors. Maryland thrift store manager Marilyn Seitz says the new rules have the potential to put the store out of business. The Pennyworth Thrift Store in Silver Spring, Maryland, isn't suffering from the struggling economy. Secondhand stores across the country are more in demand than ever as many people are desperate to save money. Instead, Seitz is worried her business may become an unintended casualty of an attempt to protect children. After a wave of highly publicized tainted-toy recalls last year, Congress passed the Consumer Product Safety Improvement Act. Then-President George Bush signed the bill in August, and new federal restrictions on lead and other harmful substances take effect Tuesday. The new rules ban lead content beyond minute levels of 600 parts per million in any product for children 12 and younger. The law not only makes it illegal to manufacture lead-laced products, but it also makes it illegal to sell them no matter when the products were made -- and stores found breaking the law could face fines of up to $100,000 per violation. 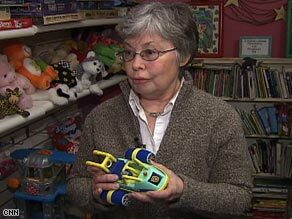 Now Seitz is going to throw away or give away her entire inventory of children's items, fearing this latest attempt at protecting kids will force the Pennyworth Thrift Store and thousands of others out of business. The ban also applies to children's clothes and books. The National Association of Resale and Thrift Shops say tens of thousands of secondhand stores across the country are at risk. Adele Meyer, the association's executive director, said some owners are preparing to shutter their stores out of fear. "This has gotten so serious, and it is so frightening, because we serve consumers that sometimes have no other way to clothe their children," Meyer said. "It was a law that was well-intentioned that has unintended consequences, that is hurting the manufacturing industry, the retailers, and the secondary market." The Consumer Product Safety Commission, the government agency tasked with implementing the sweeping law, seems to agree. CPSC spokesman Joe Martyak acknowledges the new rules are complex and confusing. "With the economy the way it is right now, we all are concerned about safety, but we don't want to unnecessarily be impacting jobs and businesses," Martyak said. He said the CPSC is trying to set guidelines to help manufacturers, retailers and thrift stores better understand what is safe and what is not. "What we've been trying to do is to point out categories that we feel and our scientists feel that are safe, that really are almost practically lead-free," Martyak said. "We have no reason to believe that there's a risk involved with them." Those categories include products made of certain natural materials, such as wood, cotton or wool; ordinary children's books printed after 1985; dyed or undyed textiles, not including leather, vinyl or PVC; and non-metallic thread and trim used in children's apparel and other fabric products, such as baby blankets. However, Martyak says even these guidelines cause confusion. "If you have a pair of pants that has two buttons, a zipper, and an applique on it, we can say our understanding is the fabric itself doesn't have lead and you're OK," he said. "But as far as those other pieces that are on the pants, that's where the problem is, because you'd have to have that tested or know some other way that it's not over the lead limit." The CPSC is allowing manufacturers an extra year to comply with the product-testing requirements, but it can't offer a reprieve for selling restricted products under the new rules. Congress has the sole power to change the implementation timeline set in the law. Martyak said the agency has tried to win some "breathing space" from Congress "to make whatever tweaks are necessary, keeping safety in mind ... but get to it in a little bit more reasonable, a sane way, because right now we're headed for a lot of chaos in the economy because of this, unfortunately." That is what has Marilyn Seitz scratching her head. "No one wants to do anything to hurt children," she said. "But you've got to stop it at the level of entry. You can't stop it when it's all over like this."